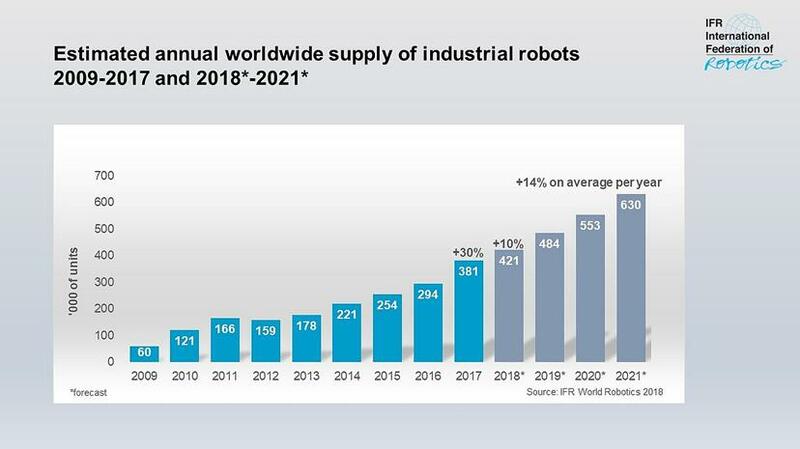 The IFR’s new World Robotics Report shows that a new record high of 381,000 units were shipped globally in 2017 – an increase of 30 percent compared to the previous year. This means that the annual sales volume of industrial robots increased by 114 percent over the last five years (2013-2017). The sales value increased by 21 percent compared to 2016 to a new peak of US$16.2 billion in 2017. China has significantly expanded its leading position with the strongest demand and a market share of 36 percent of the total supply in 2017. With sales of about 138,000 industrial robots (2016-2017: +59 percent) China´s sales volume was higher than the total sales volume of Europe and the Americas combined (112,400 units). Foreign robot suppliers increased their sales by 72 percent to 103,200 units, including robots produced locally by international robot suppliers in China. 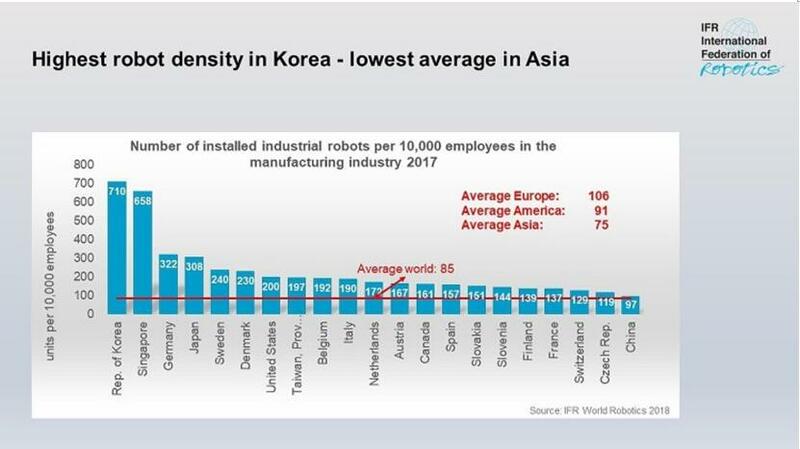 This is the first time that foreign robot suppliers have a higher growth rate than the local manufacturers. The market share of the Chinese robot suppliers decreased from 31 percent in 2016 to 25 percent in 2017. The electrical/electronics industry has been catching up with the auto industry: Sales increased by 33 percent to a new peak of 121,300 units - accounting for a share of 32 percent of the total supply in 2017. The rising demand for electronic products and the increasing need for batteries, chips, and displays were driving factors for the boost in sales. The need to automate production increases demand: robots can handle very small parts at high speeds, with very high degrees of precision, enabling electronics manufacturers to ensure quality whilst optimising production costs. The expanding range of smart end-effectors and vision technologies extends the range of tasks that robots can perform in the manufacture of electronic products.